There is no need to attach any additional components, poles or covers to assemble! -------- Just Throw it, it will Pop Up!Family camping has never been this easy. • OILEUS Pop Up Tent Material:210T TOP QUALITY DIAMOND-PATTERNED POLYESTER(umbrella rated 3000mm).Not a great tent for the rain. • OILEUS Pop Up Tent Open Size: 114.2''L*78.8''W*51.2''W. Normally it can fit 5-6 person inside. Accomodate a queen size blow up matress. • OILEUS Pop Up Tent Fold Size: 42.6''diameter, disc shaped. • OILEUS Pop Up Tent Windows:2 double-head zippered windows with mesh net.1 roof mesh window. • OILEUS Pop Up Tent Doors: 2*double-head zippered polyester doors with 2*double-head zippered mesh doors. • OILEUS Pop Up Tent Inside Pockets: 2 inside pockets for storage. HOW TO PACK UP THIS POP UP TENT-TENTS FOR CAMPING? 1. Stand on the door-side of the tent.Pick up the sidest edge of the tent（which should be on the floor). Collect all the outer edges in a row and hold he tent in the shape of a taco. 3.Fold it straight down to the ground then pushing it inside of the rest of the tent. 4. At this point the sides of the taco (the sides the shadow was initially holding) will naturally fold into each other creating the 3' diameter circle from the beginning. 5. Use the rubber to tie the tent and put it back to the package. POP UP TENTS FOR CAMPING--EASY UP: Open the package, unstrap the tent, throw it in the air, watch it open itself in seconds. No need to fumble with poles or complicated instructions. Open Size: 114''L*78"W*51"H. Folding Size: 38" in diameter as a disc. 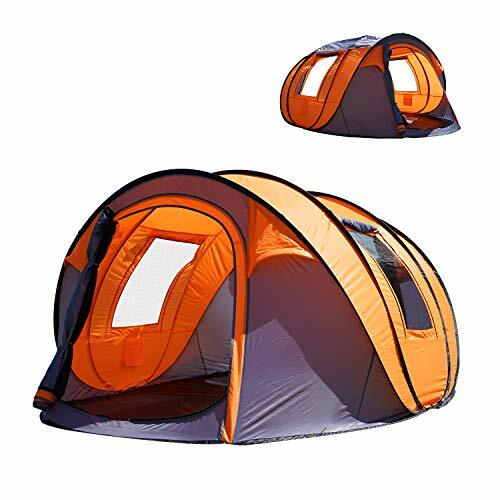 POP UP TENTS FOR CAMPING--BEST TENT FOR VENTILATION: 2 mesh doors, 2 mesh windows and an extra big mesh roof sky window. With high density mesh net, being air fresh while keep the bugs out effectively. POP UP TENTS FOR CAMPING--GREAT QUALITY AND DETAILS:CbMoun is the only seller for this kind of tents uses 210T upgrade polyester VS 190T normal polyester) Double headed sturdy zippers( enables to open and close from inside and outside of the tent). POP UP TENTS FOR CAMPING--PACKAGE INCLUDES: 14 * reinforced steel stakes(14 reinforced upgraded stakes VS 12 normal aluminum stakes); 10 * guylines( 6 on the roof cover, 4 on the tent body); 1*roof sky window cover(70"L*43"W); 1* package. POP UP TENTS FOR CAMPING--WARNINGS: This tent is water resistant but not water proof. Do not use it in extreme weather or heavy rain. ANY QUESTIONS, CONTACT US AND WE WILL SURELY FIND A SATISFYING WAY TO HELP YOU OUT. If you have any questions about this product by Oileus, contact us by completing and submitting the form below. If you are looking for a specif part number, please include it with your message.